Behind the names of three Vermillion businesses are the owners of Bru2, Dakota Brickhouse and Café Brulé. 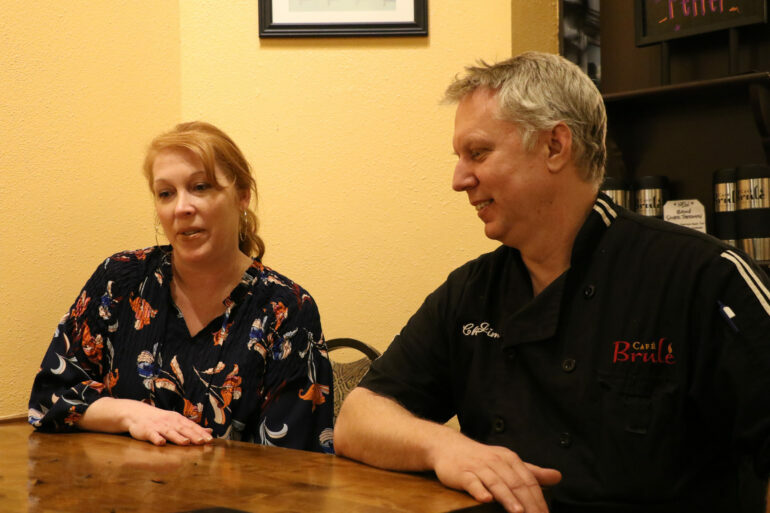 James Waters, otherwise known as ‘Chef Jim,’ and Monica Iverson, who manages ‘Cakes by Monica,’ are prominent business owners in the Vermillion community. Iverson said that it’s interesting to bring different restaurant opportunities to Vermillion. 2010 is when the co-business owners started renovating and remodeling what is currently Café Brulé, and in 2011 they opened the doors for business. Waters said the idea for Bru2 came in a conversation between First Dakota National Bank; Bru2 opened in April 2017. Iverson said that she wanted to work with Waters to try and bring back the downtown area through their third business, Dakota Brick House. Competition among the three businesses was an original concern, however, Iverson said unique menus and good service helps them succeed. Waters said that he couldn’t do his job without a great staff. “We couldn’t do anything we do without our staff. We’ve got some great general managers and assistant managers… I couldn’t do it without them,” Waters said. Luke Speers, a junior fine arts major, has been working at Café Brulé since September and enjoys the different visions that Iverson and Waters have for their businesses. Hannah Lambertz, a USD alumna, worked at Café Brulé for about three years and at Dakota Brick House briefly while she was a student at USD. Lambertz said that she enjoyed the different perspective that Waters and Iverson both offered. Iverson said this will be the last year ‘Cakes by Monica’ serves wedding cakes, but she will continue to make specialty cakes and desserts. Waters has always been surrounded by cooks. His mother, Billy, remains a mentor to him. Waters learned to cook from a young age in his family’s restaurant, the “Big 10-4 Truck Stop” near Sioux Falls. A couple years later, Water’s father, Paul, moved to Arkansas to open “Our Place.” Waters stayed with his mother where he worked as a night manager, baker and prep-cook at multiple locations. He soon moved to Vermillion in the ’80s and became assistant director of food services for the USD food service program. While spending time at the university, Waters earned his certificate in management at the University of Nebraska-Omaha. Waters said that people in the community know and respect his hard work. Iverson is an alumna from USD with a masters degree in secondary education. She loved baking and traveling at a young age. Iverson said her mother, Bonny, serves as an important mentor to her. Her mother held the title of ‘cake lady’ in the family. Iverson moved to Vermillion to study at USD in the late ’80s. While in school, Iverson studied abroad for a year in France, which is where she gained a lot of her cooking inspiration. With Iverson and Waters being co-business owners, Iverson said that this can be seen as a sibling rivalry. Waters said that he and Iverson are meant to work together. “I knew she was passionate and as crazy as I am and so I knew she would work just as hard as I did,” Waters said. Iverson said that the community of Vermillion is one that will always be home to her. Waters said that he felt there was no need to go anywhere else.